When in Turkey you really have to sample the culture with all the senses. We have tasted the baklava, seen the Hagia Sofia, smelt the spices in the bazaar, heard the muezzin sing the call to prayer and now it was time to feel the sensuous delights of the Turkish Bath. A sauna to warm us up, a cold shower, scrub down and then a soapy massage and we felt like new men. 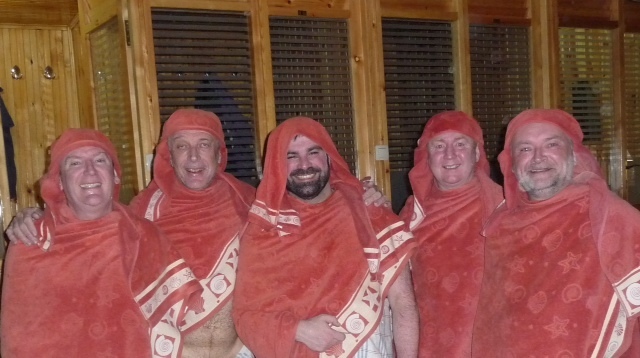 Here Steve L, Patrick, Sam, Nigel and Deefor are sporting the very latest in after hamam wear.